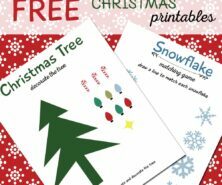 Slime is one of our favorite science activities and we like to make it holiday-themed when we can! 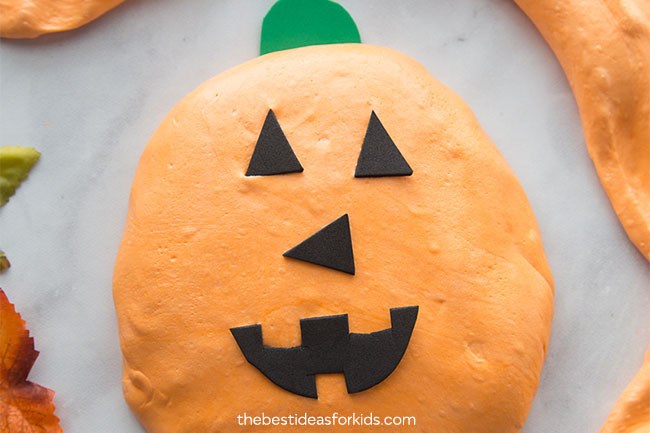 This fluffy pumpkin slime is a perfect Fall and Halloween science activity with kids! 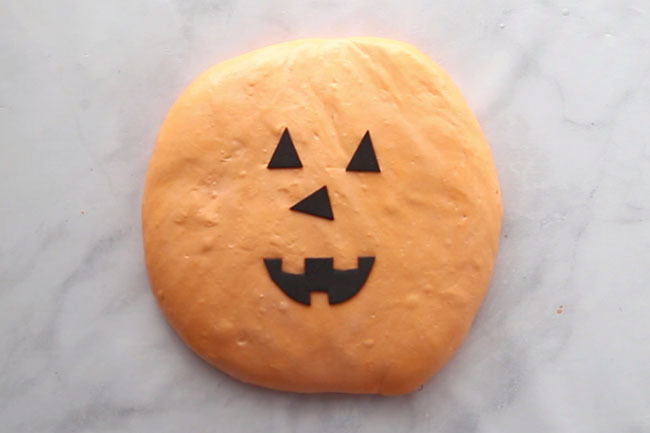 We’ll even show you how to turn your slime into a jack-o-lantern pumpkin! Kids will love playing with this fluffy slime for Halloween. This would also be perfect to make for a Halloween party or sensory activity. If you’re looking for some Halloween activities to do with your kids this year, making slime can be a fun sensory activity! 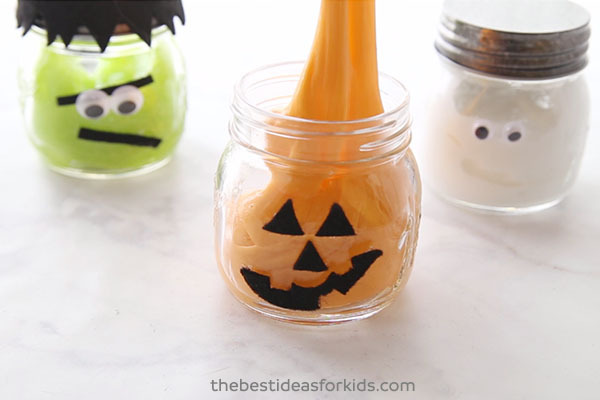 You can even do a craft day where you make slime and some Halloween jars to go with them. See how to make a pumpkin, ghost and frankenstein Halloween slime jar here. We love how simple fluffy slime is to make! Our recipe has been developed to make it a little more stretchy than other fluffy slime recipes you may try. We add in water to help with this. If you want it less stretchy, you can skip the water. At first it will feel really sticky when you’re making it – and that’s normal! It requires a lot of kneading before you get the consistency that makes it less sticky. You can always add a little more contact solution if you still find it sticky but we recommend trying to knead more first so you don’t make the slime too hard. Also keep in mind that any fluffy slime loses its “fluffiness” after a day. It’s still fine to play with the next day, but it just won’t be fluffy anymore. What is Pumpkin Fluffy Slime? Fluffy slime is regular slime made with shaving cream. The more shaving cream you add, the fluffier it will be. For this activity we recommend only 2 cups so that you can make it into a jack-o-lantern. 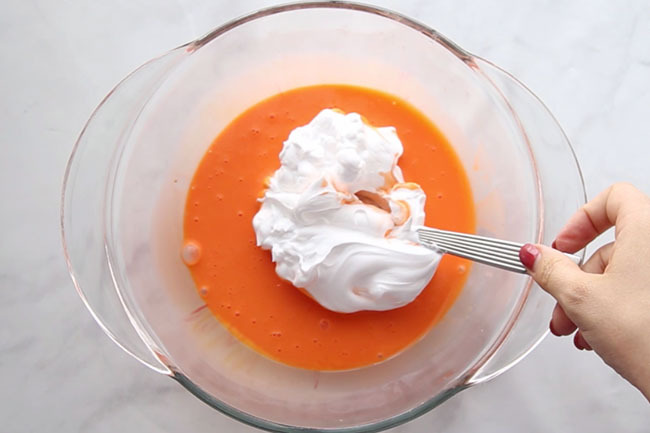 If you add too much shaving cream it will be harder to form into a pumpkin shape. If you want to make sure your slime turns out – be sure to read the instructions carefully. The type of contact lens solution you need and glue is very important! Substituting these ingredients for other brands may result in your slime not working. We also advise against substituting the brands we recommend. 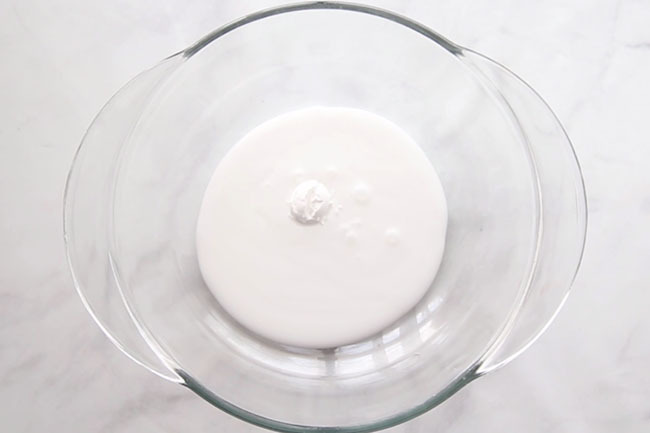 If you’re looking for a general slime recipe, our base slime recipe can be found here: How to Make Slime With Contact Solution. We like to use contact lens solution instead of pure borax in our slime recipes. 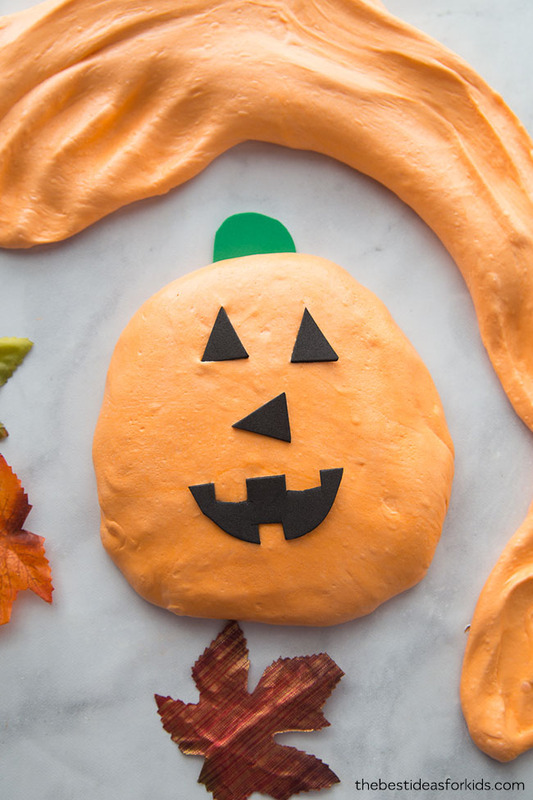 If you’ve never made slime before, we recommend you make this Halloween slime first. We recommend adult supervision and that adults only should make the slime. See more safety tips at the bottom of this post before making your slime. Once you have your fluffy slime made, have fun stretching and squishing it. Fluffy slime is a bit harder to stretch than regular slime. It’s made more for the sensory experience of pressing and squishing the slime. How Long Does This Slime Last? The shaving cream will settle and the next day your slime won’t be as “fluffy”. The slime will still be fine to keep and store. You can still play with the slime after the first day, it will turn into a consistency more like regular slime. Store in an air tight container or resealable bag and your slime should last at least 1 week. Slime is a polymer because it has qualities of both a solid and a liquid. Other examples of polymers are Jell-O, gum and rubber bands. Glue is also an example of a polymer. A polymer is made of long chains of polyvinyl acetate molecules. These chains slide easily between one another making the substance pour-able. Making slime is fun for kids but it’s also really cool science! Explain the science to your kids when you mix the contact lens solution with the glue. When you add the contact solution to your glue, it counteracts the glue and forms a viscous substance. This turns into slime and can be shaped and stretched. The slime forms when the glue molecules cross-link with the borate ions in the contact lens solution. This is a bond that causes the large molecules to no longer slide freely past one another (like the substance was when it was a glue). Therefore resulting in slime! – 2/3 Cup of Elmer’s White Glue – we like to buy this gallon size of white glue since it’s a value size. – 2 Cups Shaving Cream – Note: do not use shave gel. – 2 Tablespoons Contact Lens Solution – *Important: your brand of contact lens solution must have boric acid and sodium borate in the ingredient list. This is what interacts with the glue to form the slime. We recommend using Renu fresh or Equate brand. Do not substitute with other brands. 1. 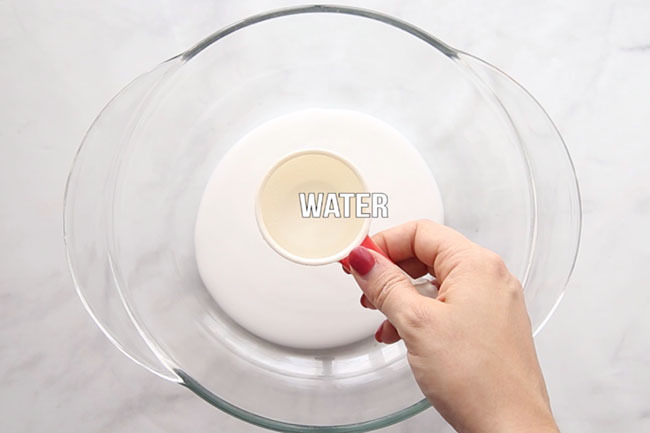 Add your white glue to a bowl. Then add your baking soda and mix. 2. Add your water in and mix. 3. Add in your orange food coloring and mix. We recommend a gel food coloring like this set which is more vibrant and requires less food coloring to work. 4. Add in the shaving cream and mix. 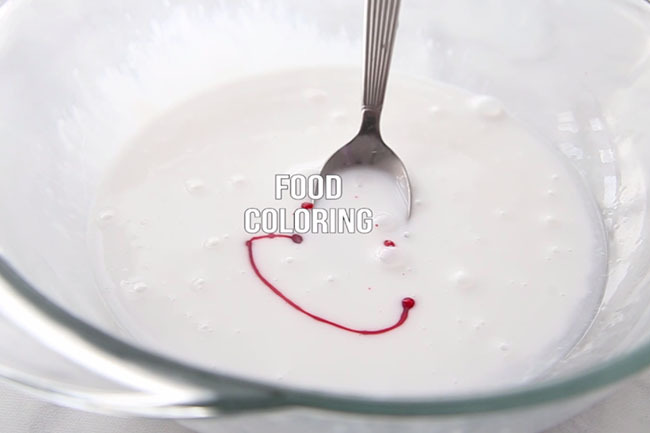 Your color may become a lot less bright so if you want it to be a more vibrant orange add in more food coloring. We like to add in 1 tablespoon, and then mix. Then add in the remaining tablespoon and continue mixing. Once the slime pulls away from the bowl, take it out of the bowl and knead for 10 minutes. The slime will be very sticky when you’re kneading – and that’s normal! Note- fluffy slime is MESSY when you’re making it. It is normal that it will stick to your hands when kneading. Keep kneading for at least 10 minutes. It can also help to let the slime “rest” for about 5 minutes on the table before you play with it. If you are finding it is still too sticky after kneading then add some baby oil or lotion to your hands. You can also add more contact solution but we recommend adding only 1 teaspoon at a time. If you add too much, the slime may become hard. 6. Now make your pumpkin! Get your slime into a pumpkin shape. Cut out the eyes, nose and a mouth from black foam paper. Add a stem to the top with green foam paper. Kids can have fun switching out the faces they add to the jack-o-lantern if you want to cut out all sorts of eyes, nose and mouth options. Now it’s time to play with your pumpkin slime! Your pumpkin slime should last at least one week if stored properly (see storage details above in the post). 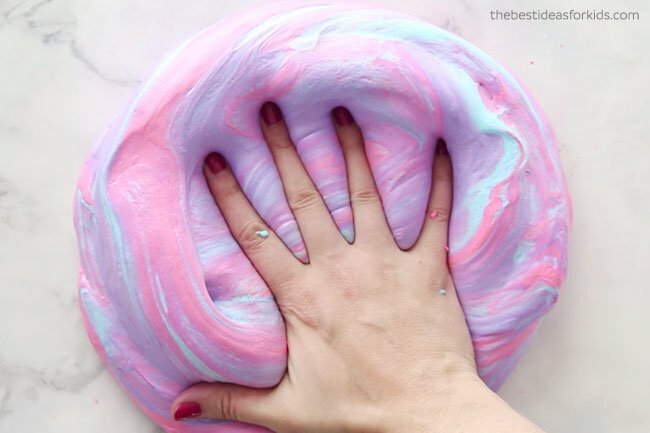 If you love fluffy slime, then you’ll love this unicorn fluffy slime recipe. 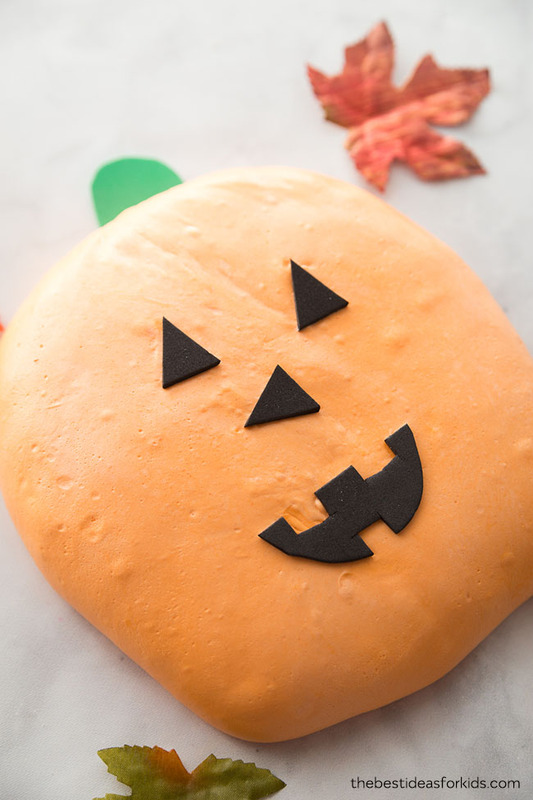 Pin this pumpkin slime recipe for later! 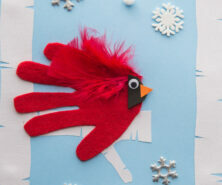 Love this and plan on making it with my kindergarteners next week. What’s the amount of slime this makes? Thanks! In the video in picture it may be hard to tell but it’s a good size that would fill a large mason jar. Just note that the fluffiness does settle after a day so if you were to fill one large mason jar, it will settle and be a much smaller volume the next day.